This cream does not have some special story related to it. I made it and photographed it a few months ago and the recipe was in the sketch quite a long time, because somehow there was always something else that I wanted to run first. Even though I really like these photos. Today this recipe was published in a Croatian magazine together with a short interview with me so it is the right time for it to get an online publication as well. Enjoy! Mix the eggs and sugar for 2-3 minutes until the mixture becomes thicker and paler. Then put them in a saucepan along with the lemon juice and lime juice, vanilla and butter and cook over very low heat for 10-15 min, ie, until the mixture thickens. It's over when the mixture can completely coat a wooden spoon, without the mixture leaking from it. Stir in lime zest and remove from heat. Immediately move to another bowl or jar, cover with plastic wrap and chill, first at room temperature and then in the refrigerator. If you don't want pieces of zest in the cream, strain it through a sieve while it is still hot. 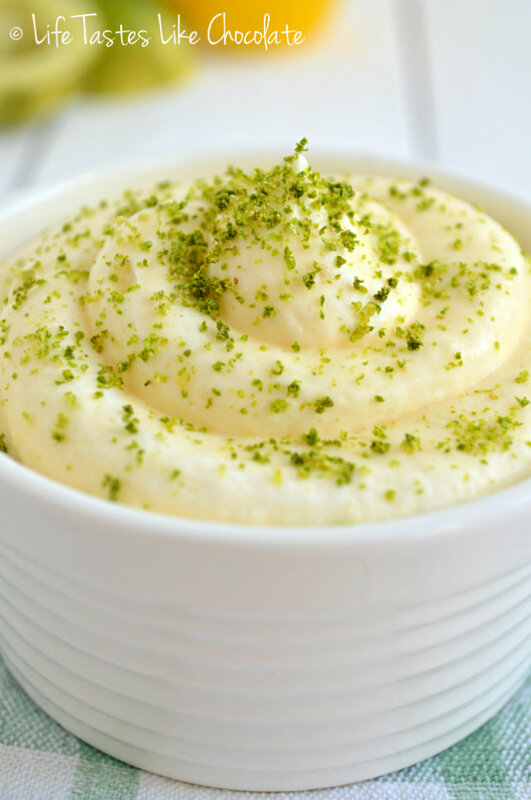 When the cream is totally cool you've got a 'lemon & lime curd' ie a traditional English cream of intense flavor that can be made from several fruits. This cream can be used as a spread on bread, filling for pies or sandwich cookies or to add flavor to a variety of other creams, and can stand for about a week in the refrigerator. To finish the dessert, whip the cream, stir into the lemon & lime curd and cool briefly. Bon appetit!